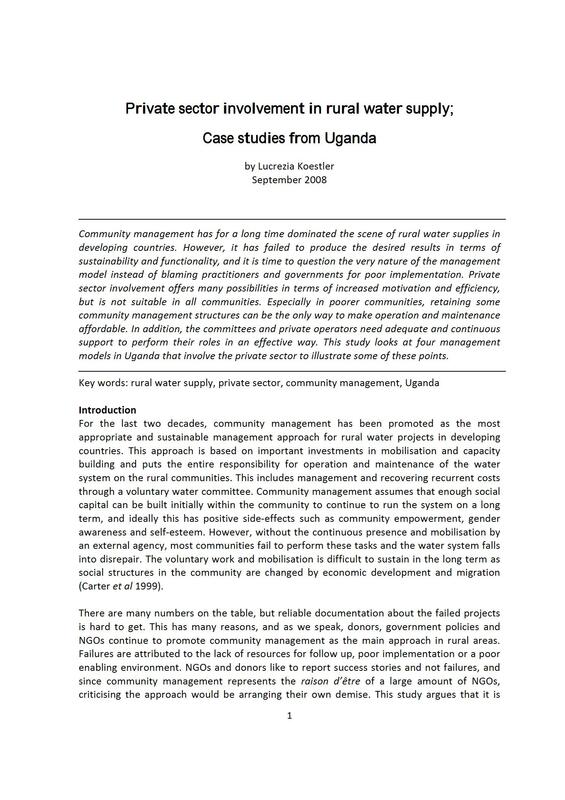 Community management has for a long time dominated the scene of rural water supplies in developing countries. However, it has failed to produce the desired results in terms of sustainability and functionality, and it is time to question the very nature of the management model instead of blaming practitioners and governments for poor implementation. Private sector involvement offers many possibilities in terms of increased motivation and efficiency, but is not suitable in all communities. Especially in poorer communities, retaining some community management structures can be the only way to make operation and maintenance affordable. In addition, the committees and private operators need adequate and continuous support to perform their roles in an effective way. This study looks at four management models in Uganda that involve the private sector to illustrate some of these points.